Larry Summers has a cutting sense of humor. For example, when he thinks a proposal calls for government heavy-handedness, he will dismiss it as “Putinesque,” a reference to the statist Russian leader. So maybe it’s fitting that some of Summers’s administration colleagues view the intellectually fierce former Harvard president, now head of the National Economic Council, in similar terms. As a handful of administration insiders have told me, more in playfulness than bitterness, Summers has the strongman’s appetite for expanding his turf, plucking far-flung policy portfolios—health care, energy—and claiming them as his own. It’s easy to see how these concerns might arise. Geithner drifted into semi-isolation after his tax scandal broke, disappearing from meetings and conference calls just as Team Obama was finalizing its stimulus and bank-bailout plans. It was Summers who often dominated internal discussions, pleaded the administration’s case on Capitol Hill, and wooed key constituencies like labor and Wall Street. Students of Obama’s economic team wondered if Geithner could make up the lost ground. But there’s a way in which the accepted storyline both overstates Summers’s imperial ambitions and understates Geithner’s savvy. The truth is that Geithner isn’t getting elbowed aside by anyone. His bureaucratic mettle is such that he’s actually shored up turf amid the recent distractions. IT’S ONLY NATURAL that a man who was hailed as one of his generation’s great academic minds by age 30 and who’d become Treasury secretary by 45 would have strong opinions on a thick menu of issues. Or, for that matter, that he’d have an urge to share them. In the years before he joined the Obama administration, Summers showcased his thinking on practically every economic ailment facing the country in a monthly Financial Times column. He is, in other words, not so much a bureaucratic imperialist as a natural-born economist, with all that implies about argumentative style. In the White House, his probing questions can sometimes make it unclear who’s running a meeting and who’s just attending, but they’re standard fare in graduate seminars across the country. In any case, Summers has actually worked hard to sand down his rough edges—and won surprisingly good reviews for his politicking. “He’s not always been Mr. Diplomacy,” Senator Kent Conrad recently told me. “But I have seen him use diplomatic skills equal to almost any I’ve seen on display in the current crisis ... answering questions hour after hour after hour.” Even those who’ve sparred with Summers consider him fundamentally persuadable. “He is the kind of guy that gives an opponent much wider latitude if they bring facts to bear,” says one colleague. Still, the star economist’s own defenders are quick to concede his faults—or, in some cases, even wield them as a cudgel. One Senate aide says that, when Geithner’s tax problems cropped up, various Obama political hands not-so-subtly hinted that Summers would be next in line at Treasury—a way, they hoped, of making senators think twice before trashing their nominee. HAVING TO SHARE territory with the inadvertently expansionist Summers could easily lead to a demoralizing trench war. But that won’t be the case with Geithner. He’s a man who made a career not only of exerting subtle bureaucratic influence, but of happily co-existing with Summers himself. (The two are good friends.) Even during the tax flap’s most fevered moment—a Maureen Dowd column titled “Tim Geithner! Why Are Rich People So Cheap?” comes to mind—Geithner remained an internal force. At the time, Politico suggested Summers had horned in on the bank bailout—ostensibly Treasury’s portfolio—noting that it was his name, not Geithner’s, that appeared on a letter to Congress about the second $350 billion installment. But, while Summers did affix his name to the letter, Geithner and his staff actually authored it. Administration officials simply felt Summers was the more appropriate public face until Geithner could be confirmed. In the coming days, Treasury will begin unveiling proposed fixes for the banking crisis that should make clear it is leading those efforts. In fact, Geithner has been building an inner sanctum geared toward having an impact across the board. His chief of staff is a former Tom Daschle lieutenant named Mark Patterson, who, not long ago, was considered one of the most powerful and wired aides in the Senate. “He knew everything about anything that happened on that floor,” says one former colleague. “He can do the policy and the politics and the communications. It’s a real gift.” Patterson’s tour in the Senate included a stint as a staff director for the Finance Committee, which afforded him enormous input on everything from taxes to Medicare and Social Security. Even more significantly, Geithner has signed up Gene Sperling—who held Summers’s current job back in the Clinton administration. The early reports on Sperling’s hiring modestly described his title as “counselor,” but this vastly undersells his mandate. As a practical matter, Sperling will be Geithner’s deputy on domestic policy, giving Treasury a presence on the order of Summers and budget director Peter Orszag in negotiations over the stimulus, entitlements, and health care policy. That Sperling has a chummy rapport with both men doesn’t change the significance of his role. Insiders see Sperling as the key sign Geithner envisions a broad role. Indeed, the masochistically hard-working ex-Clintonite served as Treasury’s ubiquitous proxy during White House stimulus discussions while Geithner managed his tax scandal. By turning to Sperling, Geithner has also shifted the ideological balance in intramural debates. 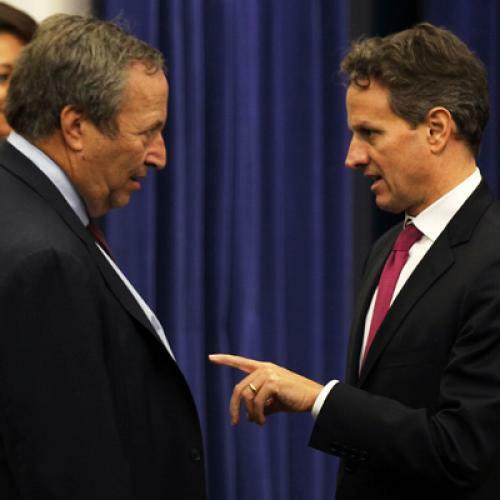 Geithner and Summers tend to see eye to eye on fiscal issues—they’re both relative hawks. But Sperling’s spending instincts are somewhat more liberal. Which is to say, by bringing Sperling aboard in part to protect his bureaucratic flank, Geithner may actually shift policy slightly to the left of where he’d prefer it. In this, as with everything else, Geithner’s early moves at Treasury reflect the habits that powered his rise from lowly civil servant to undersecretary in the ‘90s: Keep a low profile, solicit a range of opinions, trust your subordinates—and, above all, know your boss intimately. What ultimately puts Geithner and Summers on equal footing is their formidable relationship with the president. Obama is said to be taken with Summers’s intellectual nimbleness; it’s not hard to imagine how the Harvard Law-grad president might be flattered to receive a daily economic briefing from the former president of Harvard, a ritual that began shortly after the inauguration. But Geithner and Obama have a kinship that grows out of both sociology and disposition. Like Obama, Geithner spent a chunk of his childhood overseas—first in India, then Thailand. His father was a Ford Foundation official who, according to The New York Times, actually funded a development project that employed Obama’s mother. (The paper believes the two may have even met in Indonesia.) Geithner also exudes an Obama-like perma-cool. Steve Radelet, a former Treasury subordinate, recalls how he once ignited a bureaucratic uproar that wound up blowing back into Geithner’s face. “He was very good at calling me in and saying, ‘Look. You were right. It was exactly the right decision. But do me a favor, let me know next time,’” says Radelet. In the end, Geithner should probably be more wary of another Clinton-era principal: Hillary. Foggy Bottom has spent the last month hinting at its designs on economic policy, which would presumably come at the expense of Treasury. The latest indications are that Hillary’s first target may be the U.S.-China relationship, which Geithner’s immediate predecessor, Hank Paulson, spearheaded in the Bush administration. Publicly, Treasury officials welcome a more active role for State. Privately, they say parting with Paulson’s brainchild, the Strategic Economic Dialogue, is highly unlikely, noting Geithner’s longstanding experience in the region. Let the border skirmishes begin.